A complete re-roofing is a huge undertaking. It’s an extensive amount of work for a roofing company, and, as long as the project continues, your building is exposed to the elements. Because re-roofing is such an intensive process, there are a variety of things that can go wrong. Here are four things you should be aware of when planning to undergo a re-roofing project. 1. Inclement weather during the re-roofing. One of the biggest risks during a re-roofing project is rain. Generally, rain is an inconvenience, however, during a re-roofing project, it can be disastrous. Since the “guts” of your roof are exposed during the process, prolonged rain exposure could cause saturation of the roof’s decking or insulation, which could then require repairs before completing the re-roofing. A reputable commercial roofer will choose a time of year for the project when the risk of precipitation is as low as possible. 2. Failing to get a thorough inspection before beginning the re-roofing. On a project as extensive (and expensive) as a complete re-roofing, surprises are unwelcomed guests. For example, if you’ve already budgeted thousands for a re-roofing project, the last thing you want to hear is: “Well, when we got up there, we noticed some unexpected damage. If you want us to fix it, we’ll need to discuss a new quote.” That’s why it’s important to have a thorough inspection performed before any re-roofing project. This way, the roofer knows exactly what he’s required to do and will have the materials and labor on-hand to perform that task as quickly as possible. Surprises don’t just add to the bill, they add to the timeline, too, further increasing the possibility of inclement weather exposure, as noted in the first point above. 3. Going with the lowest bid. “You get what you pay for” is a cliché, but it’s true. Often, the lowest bid on a project is not coming from the best company. That said, the most expensive bid on a project is not a guarantee of quality, either. The bottom line is this: During a re-roofing, you are not only spending a significant amount of money, but you’re also making a decision that could affect the next 20-50 years of your facility. Resist the urge to make such a huge decision based on cost alone. Find a reputable roofer with extensive work history and a penchant for doing quality jobs. 4. Materials left around the job site. 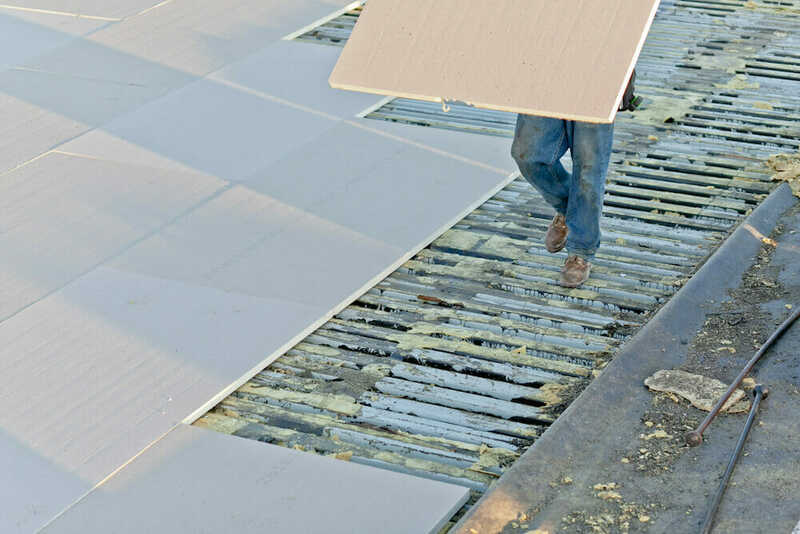 While it may seem immaterial in comparison with the other items on this list, roofing materials scattered around a job site can be a real hassle for employees. Can you imagine walking into work, putting in a hard day’s work, then coming out the door to find you have a flat tire due to a roofing nail you ran over when parking that morning? Issues like this are often avoided by heeding the advice in point number three above and choosing a reputable vendor. A re-roofing project is a huge undertaking, worthy of your utmost consideration and thought. Use these four tips to avoid some major pitfalls of such projects. If you’re interested in learning more about how Maxwell can help guide you through an extensive re-roofing project, just click here to contact us.